• What defines a radical archive? • What can be productive relations between community-based or independent archives and more established (and establishment) institutions? • What tools and processes are making it easier to document, catalog, and share oppositional cultural objects? • What is the role of ordinary people in building useful collections? 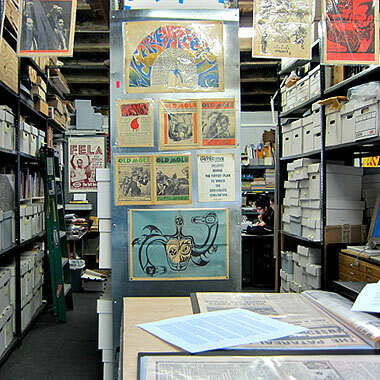 Lincoln Cushing is a professional archivist responsible for Docs Populi – Documents for the Public, documenting and disseminating social justice poster art. He is also archiving consultant with the Oakland Museum of California helping to process the All Of Us Or None poster collection. Claude Marks is the Director of The Freedom Archives, a political, cultural oral history project, restoration center, and media production facility in San Francisco. Nathaniel Moore is an archivist at the Freedom Archives. He has a MA in African Studies and a MS in Library and Information Science from the University of Illinois. Categories: Uncategorized | Tags: archives, libraries, museums, social history | Permalink.